So finally it is here. Unlike the open and inclusive approach by the folks over at Fiio who had entertained some of the usual ridiculousness over at head-fi, Ibasso has kept the DX50 tightly under wraps. Announced some months back the only real information available has been that which has been put out by Ibasso themselves and very limited at that. The DX50 enters into an ever increasing market of non-mainstream standalone DAP's designed for audio enthusiast. Now its time to find out how it stacks up. The comparisons with other DAP's will be added over the next week as they arrive, I have managed to borrow both an AK100 and X3 which I do not own but both will be compared over a day or so with direct A/B comparisons. The DX50 comes in a very nice looking box which implies that something very classy is lurking beneath. You won't find earphones included (Ibasso doesn’t do headphones... yet) so don’t be surprised, this is designed for audio enthusiasts who will most likely be using there own sets. There is a generic carry case that fits snuggly, a usb Coax cable, a micro usb charging and data transfer cable and a screen protector included and thats about it. Simple, clean and to the point. This thing looks incredible, just a lovely piece finished in brushed aluminium and some plastic. It has a modern look blended beautifully with retro hints. The screen is of IPS quality although lacking a touch in pixels it performs well and is very responsive to touch inputs. Everything feels rock solid and well put together, I especially like how tight the jack points are. The buttons are nice and tactile and give a great option for operating from ones pocket. The back is removable and allows access to the user replaceable battery, a very welcome feature indeed. On top sits a micro SD slot allows users to expand on the included 8gb internal storage, a coax out point and the micro charging port which doubles up as a usb OTG port. To the right a nicely placed set of volume rockers. The left has both a the power button and a physical hold switch, a feature often overlooked. On the bottom of the DX50 we can find both a headphone out and line out respectively along with a gain switch with 3 settings. Finally the front has 3 buttons (back, forward,play) and of course that touchscreen. Hard to believe that Ibasso can offer all this at such a price when the production numbers are so low. Its absolutely jam packed with features to tickle the cough audiophiles. The Firmware is to be considered V1 and for the most part works absolutely fine, it seems to be a custom very basic version of android. It should be noted that some users have had a couple of bugs however so far I have been bug free bar one lock up within the first few minutes. It has a very modern look to it with the brushed wallpaper mirroring that on the hardware and the orange colour chosen for the them is also very easy on the eye. It is snappy and works well with a full range of features and file support. Almost any format that a sane person would wish for is there. There are a range of preset EQ settings which are actually quite good in certain situations but users also have the option to tinker with the 8 band customs settings. Other features which set the DX50 apart from consumer devices are gapless, USB OTG and a true line out, 3 setting gain switch, 256 point volume control. Remember I am solely using this as a stand alone or through the line out. So cant comment on they oft ridiculous (and largely pointless) “stacks” that people will use this with no doubt complaining about one strange quirk or another. But in the most part the firmware has been a joy. It scans my media fast from 32gb and 64gb cards respectively and whizzes along through menus. Really the only complaint is the white font being a little jagged screen....but thats only if i'm trying really hard to moan and is probably because we are now so accustomed to retina style displays on our phones. I will go as far as to say straight out that the player might be the best out of the other players listed. There is a Wolfson 8740 Dac chip which is a favourite of myself and many others since the days of the s:flo2 (one of my all time favourite sounding players) combined with an amp section designed by Ibasso. Both of these factors give indication of how capable this thing could be. Bass is wonderfully tight and accurate, an area which a lot of players struggle to get right by either bleeding into the mid section, being non existent or just flat out overwhelming. Not here. The bass sits nicely in line with the rest of the spectrum. Treble has a slight emphasis which I personally prefer as I am more a fan of using earphones with a slight warmth. I find that DAP signatures with a slight emphasis in this region work very well with the phones I am likely to use, the best pairing synergy wise which I had found was the GR07 BE and my new favourite (and massively underrated) Monster Gratitude and UM miracles. Users with treble specific phones will not be disappointed however as you can use the EQ to dial it back if a touch to sparkly for you. Treble much like bass is divisive and very much down to preference. Again when paired with the right headphones separation is right up there with the best I have heard from a DAP. Again the Gratitudes shine in bringing all of this out as do the Audeo PFE. A nice black background which is evident here just as on the Colorfly C3 certainly adds to this. 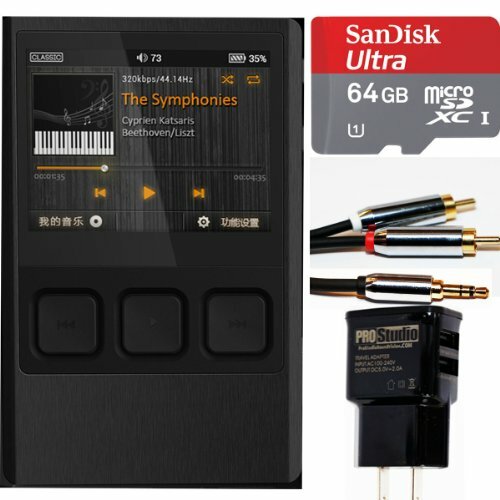 Soundstage is quite large for a portable player, however I have always found that soundstage is much more easy to expand when using the right headphones rather than DAP's, which when you get to this level do not vary to much. This review was my most intensive yet as to the demand for the player however I will update with any issues as I go on from here. These will be included at the bottom of the page.